50% OFF [1,999,011] for training and retraining of crew during recruitment and transfer to another technique for game gold . Discount 25% on the training and retraining of crew during recruitment and transfer to another technique Credits . 50% OFF to reset the learned skills and abilities crew for game gold . Discount 80% to change the passport these crew members. Discount 50% for additional beds in the barracks. Constraints Random battles. tasks can be performed unlimited number of times . tasks can be performed unlimited number of times. Remember that all current active World of Tanks you can learn from . 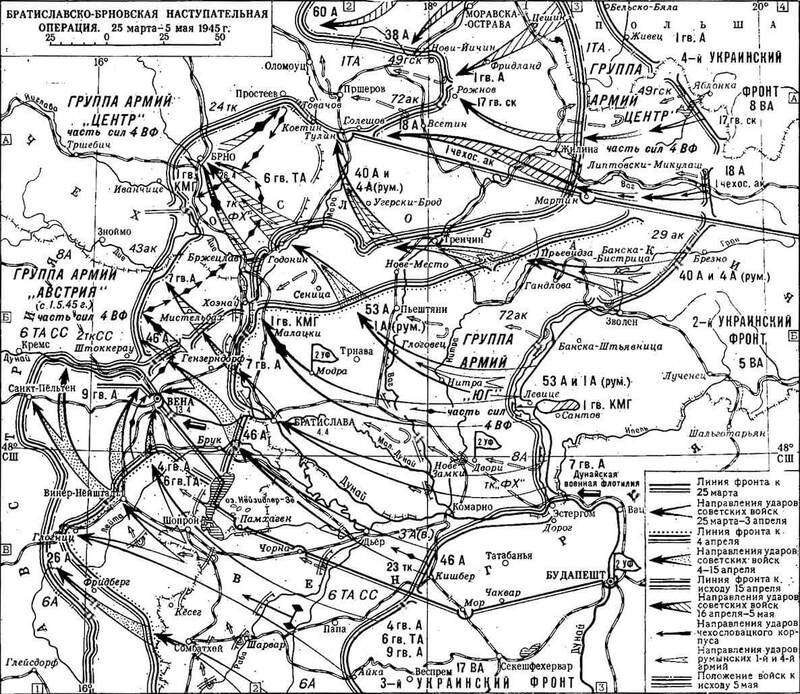 Bratislava-Brnovskaya Offensive conducted from March 25 to May 5, 1945. The objectives of the operation were the completion of the liberation of the territory of Slovakia from the Germans and the destruction of enemy forces near the cities of Bratislava and Brno. Capture Brno was important also because this city is the largest military-industrial center. Soviet troops in the operation were presented by the 2nd Ukrainian Front: 40th and 53rd Army, 7th Guards Army, 1st Guards mechanized cavalry group, 5th Air Army, the Danube Flotilla and also the 1st and 4th Romanian army. There are about 340 thousand people, 240 tanks and self-propelled guns, 6,100 guns and mortars, 645 aircraft. On the German side in the battle attended the 8th Army from the Army Group “South”. It included the 29th and 72th Army Corps and the 57th Tank Corps. Air support was provided by the 4th Air Fleet. The total number of German forces – about 200 thousand people, 120 tanks and assault guns, 1,800 guns and mortars, 145 aircraft. German troops were counting on a strong network of fortifications, which were based on natural barriers such as rivers and mountain ranges. The situation is aggravated by the fact that many rivers overflowed and became difficult to force. The idea of ​​the Soviet command provided the brunt of the 53rd and 7th Guards armies in Bratislava, Malacky, Brno. To the north, in the direction of Trencin, secondary attack inflicted 40th Army. On the night of March 25, advance units of Soviet troops crossed the river Hron and seized a bridgehead, which during the day were shipped main forces of the 7th Guards and 53 th Army. March 26 start of a breakthrough in the depth of mechanized cavalry group. By March 28, the breakthrough reached 40 km depth and 135 km wide in front. Somewhat later launched 40th Army, resulting in the enemy defense was broken through all along. 1 April troops of the 7th Guards Army came to Bratislava. The enemy turned the city into a reliable defensive unit, particularly strong on the eastern outskirts. Front commander gave the order to get around the city from the northwest to avoid excessive damage in the assault. However, street fighting still were, they lasted for two days. By the end of April 4 Bratislava was released. Developing the offensive, Soviet troops broke through the defensive line and Moravian April 23, reached the approaches to Brno. At this time of the 2nd Ukrainian Front was returned to the 6th Guards Tank Army, previously participated in the Vienna operation. Sturm Brno began on April 26 and the end of the day the city was taken. After that, the Red Army launched a further offensive in the direction of Olomouc, meet the troops of the 4th Ukrainian Front to encircle the German 1st Panzer Army. In this area, fighting continued until May 5. 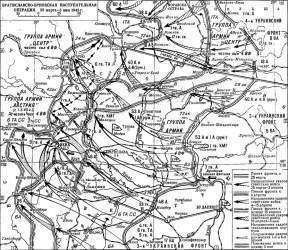 As a result of the operation, Soviet troops completely occupied the territory of Slovakia, advanced 200 kilometers and created conditions for the further advance of Prague.